Journal Lisanuna: The present this journal is a place for lecturers in the Departement of Arabic Language Education Faculty of Tarbiyah and Teachers and Lecturers of UIN Ar-Raniry Banda Aceh to general channel their ideas the study of Arabic and learning, as well as observers forum and Arabic educational practitioners to distribute writing, ideas study and insights, both from within the UIN Ar-Raniry campus environment and from outside UIN Ar-Raniry campus, including Arabic teachers at Madrasah and Public School. Currently, there is still minimal media to facilitate Arabic scientific articles studying Arabic and learning. 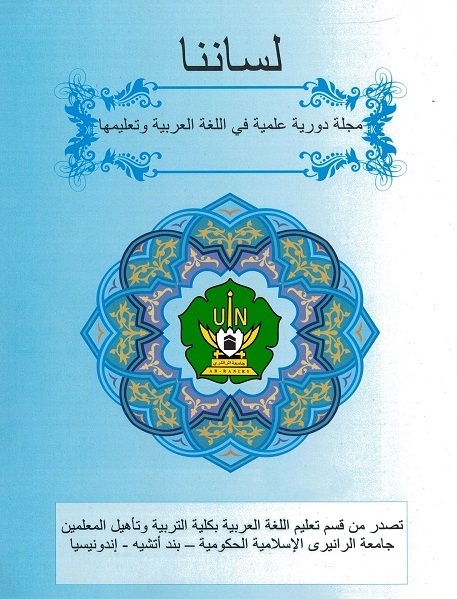 The Journal Lisanuna Departement Arabic Language Education Faculty of Tarbiyah and Teacher UIN Ar-Raniry wishes contribute to study of Arabic studies and learning too.